Remains of Jews who perished in the Great Revolt against the Romans and were discovered in Binyamin secretly buried in Ofra. The bones that were discovered are of seven women and a boy who hid in a cave, and were killed by the Romans in 69 CE, one year before the destruction of the Second Temple. 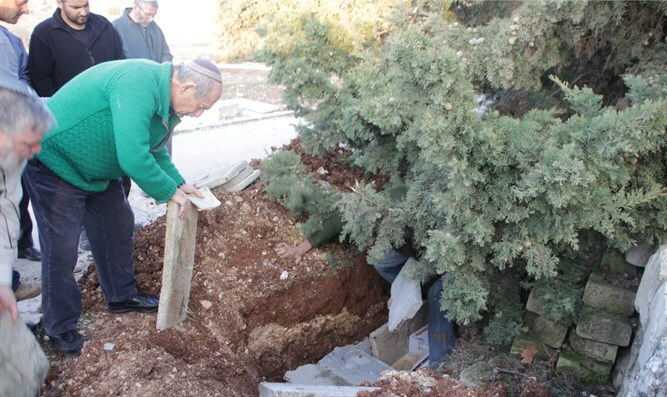 Due to an unsuccessful dispute between the residents of Ofra and the director of antiquities at the Civil Administration, the bones were buried in January, hastily and secretly, and the burial was only permitted for publication on Friday morning. The name of the Jewish village in which the bones were discovered is unknown. The bones of the seven women and the boy were found inside a cave in an olive press which contained a hiding place. Two rock-hewn ritual baths were found next to the cave. Scientific testing determined that the bones are from the first century CE. Along with the bones, evidence of the brutal killing was discovered, in the form of arrow heads and shoe studs of Roman soldiers. The archaeological excavation was carried out by an American delegation headed by Dr. Scott Stripling and Dr. Bryant Wood. The bones of the victims were identified in 2013, as noted above, and were examined in laboratories for the purpose of determining the date of death. Only this past January were they transferred to Hevra Kadisha and buried in Ofra. The residents of Ofra built a monument using natural stone on the grave of the women, and placed an explanatory sign that tells their story. A second panel bears the story of the vision of the dry bones from the Book of Ezekiel.